Carbon. Since the advance of the industrial revolution we’ve been emitting carbon into our environment at disturbing rates. 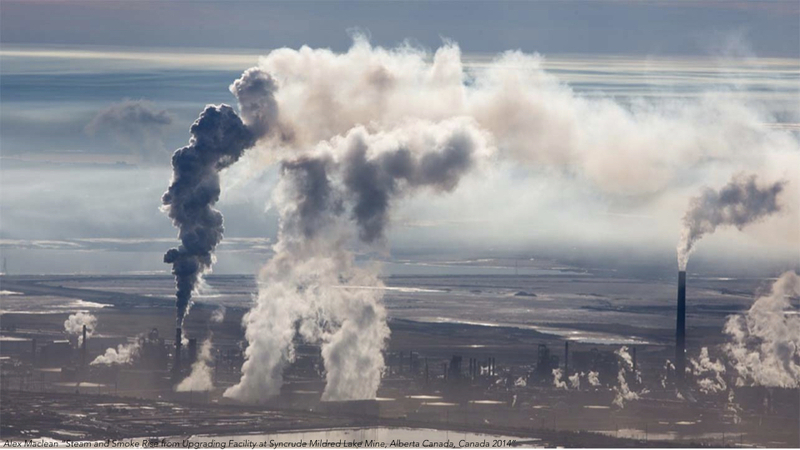 In fact, the majority of carbon emitted into the environment has been over the last 30 years. This is since Al Gore’s first book on Global Warming meaning that we’ve done more damage to the environment knowingly, then we’ve ever done in ignorance. 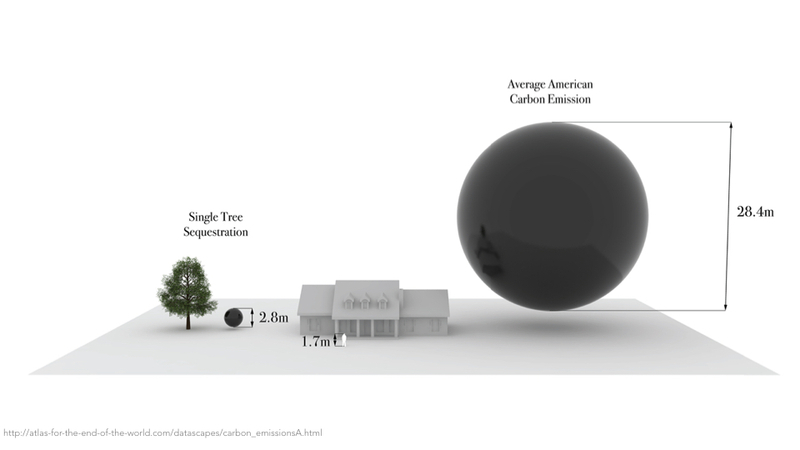 This is a graphic comparing the amount of carbon produced by an average American vs the amount sequestered by a single tree. This shows how the damage, still irreversible, requires further mitigation. We need to move away from our dedication to fossil fuels. In addition to the complex challenges of climate change our environment us at risk based on future expansion of the world’s population. Based on the average of the UN’s projection of global population of between 9.5 and 13 billion 2100, this graphic showcases the world we have, vs the world we’ll need for 10 billion. This considers land required for future urbanization, agriculture and the preservation of our natural ecosystems. It is projected that up to 3 billion of the future 10 billion will live in cities. To accommodate them, this would require the addition of 357 New York Cities over the next 80 years. That equates to about an average of 4.5 new big apples per year. It’s important to consider infrastructure within the conversation of climate change. We believe that infrastructure will no longer be buried underground or strong along poles, but rather integrated into our cities in a purposeful way. Here, we were hired by a local utility provider to design a solar roof canopy over the existing Bayfront amphitheater in downtown Miami. The location of this project became a huge opportunity to showcase our ideas about the future of infrastructure in the city. Here, in the cities public park lying at the threshold between the urban core and the bay. 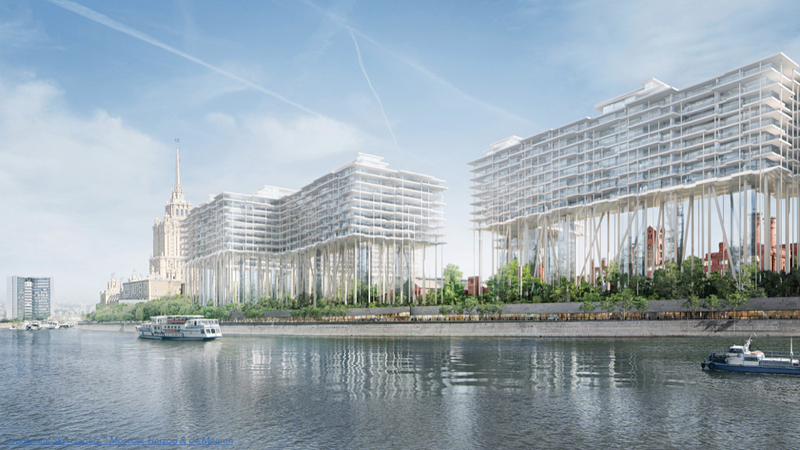 The site will be seen from land sea and air, requiring an iconic presence front and center of the city. We looked at other identifiable objects around the world and determined that the most suitable form for Miami would be the circle, a symbol of unity, inclusiveness and community. At night, the circle glows to communicate the story of energy to the surrounding context. In a bright sunny day, the circle shines bright to showcase how much energy was collected. Alternatively, on a cloudy day the circle would be dim. The circle also has the capability of blinking red in anticipation of a hurricane or bad weather. Infrastructure becomes a city-wide communicator, while also serving a purpose. It was important to not disturb the abundance of landscape within the park so the ring has been designed to sit on a total of 8 V-columns which lightly perch down onto the site. At the center, a fabric canopy can be deployed in need of shade or protection of the rain. All the while, preserving the incredible experience of seeing a show in the park at the edge of the bay. 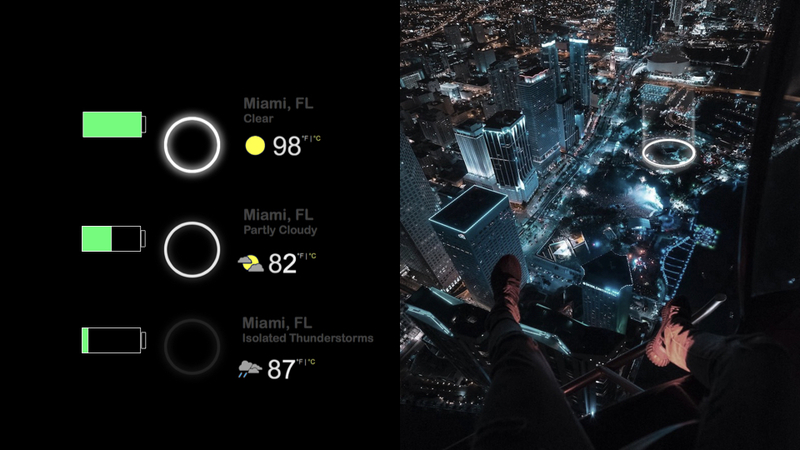 These night and day images show the ring both in active and passive use. When the canopy is deployed, it can be used for 3D projection mapping to enhance the experience of a concert, while deconstructing and disappearing into the landscape when retracted. 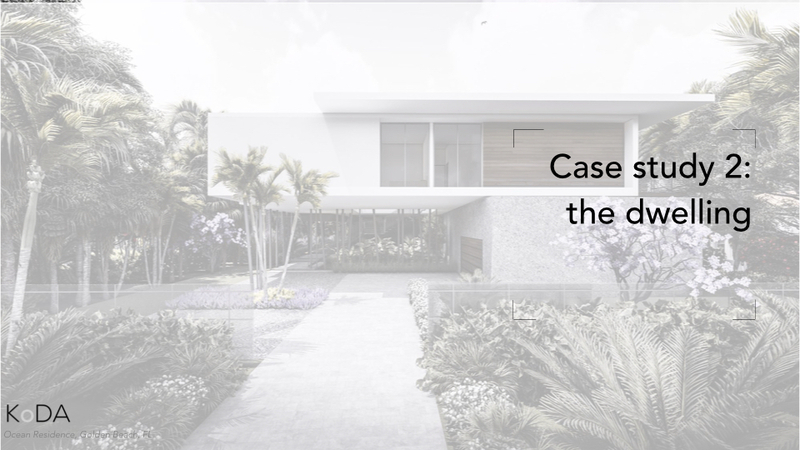 The second project I would like to share is how Metabolist concepts have inspired a single-family residence that we’re designing within an oceanfront community. The Atlantic Ocean is here, and as such creates strict coastal construction requirements for properties on the east side of Ocean Blvd. Our site is on the opposite side of the street, yet does not have the same requirements of breakaway construction, wave crest heights, etc. 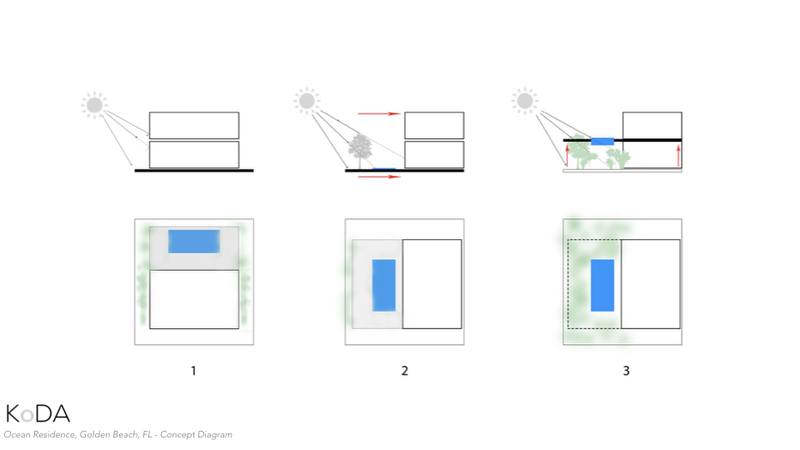 The diagram on the left represents a typical development in this community where the building envelope is maxed out on the site and a pool deck is pushed to the rear, allowing for minimal side yard landscaping. A more responsive solution for the pool would be to create a side-loaded scheme where the pool can gain full east, south and western sun exposure and allow for even more landscaping along the rear. Finally, our scheme was to elevate the exterior ground floor programming, including the pool, to a raised platform. This allows for even more sun exposure on the elevated pool deck but also restores the ground back to landscaping to serve as a garden amenity and a natural ecosystem for flora and fauna. 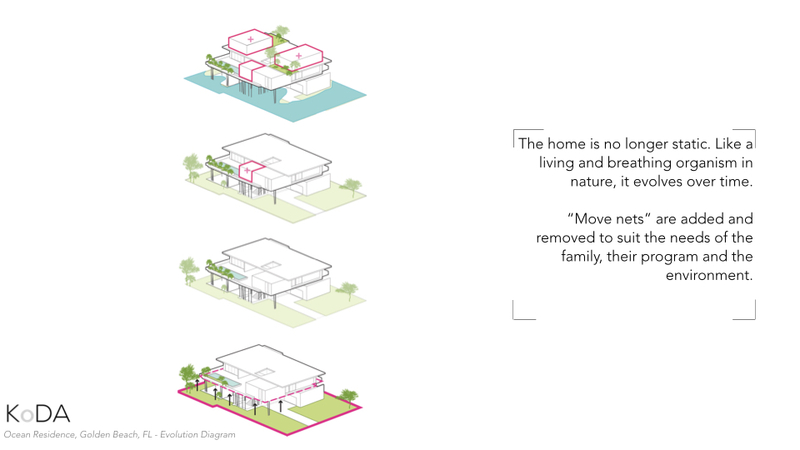 In this way, the home is no longer static, but yet an ever-evolving organism in nature that can respond to the needs of its inhabitants and surrounding environment. In times of flooding, the natural garden on the ground floor acts as a bio-swale and naturally re-charges the water aquifer below the ground without the need of costly and disruptive drainage infrastructure. This is a view showing the ground floor garden, when initially built next year. While this shows the home in 2100, when the ground floor is abandoned and returned back to its natural state as a habitat for flora and fauna as well as a bio-swale for flood events. Another view from the ground floor garden. You can see the pool at the second level which contains a skylight to the garden below. Again, the possibility of a restorative evolution of the ground floor to nature over time. The second-floor deck showing new developments added over time. The third and final case study is our look at the city. Again, inspired by the Metabolists, like Kenzo Tenge’s plan for Tokyo Bay, we’re currently looking at a design proposal to urbanize Biscayne Bay. While this seems like a very abstract and perhaps even crazy idea, it’s important to remember that the identity of Miami is synonymous with amphibious architecture. On the left, you see a typical Chickee hut developed by native tribes in South Florida such as the Seminoles and the Tequestan Indians. On the right, you stiltsville which has become identifiable with the city through local and popular culture. Another example of our imposition on the bay are the man-made islands such the venetian islands here on the left. 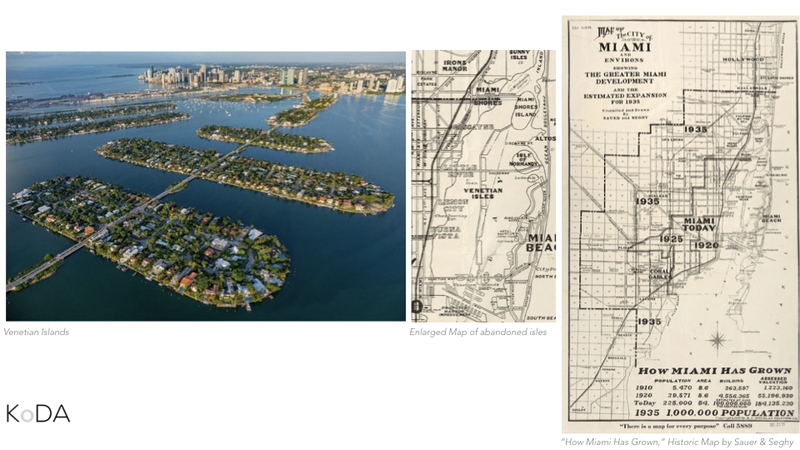 On the far right, you see a historic map of Miami chronicling it’s development over time. In the middle is an enlarged portion of the map which shows a north south expansion of the islands through the middle of the bay. Of course, this was abandoned. In this image you can see a faint rectangle formed by black dots in the bay. These are the piles that were put in place in the mid-1920’s, but then later abandoned because of the impacts of the great depression of the early 20th century. What’s interesting here are these dark green spots on either side of it. These are actually sea grasses in the bay. They thrive in this location because the piers prevent boat traffic from traversing this area and this of course, is one of the largest threats to sea grasses in the bay. Manatee’s also take refuge within the perimeter of these pilings. Most are familiar with Christo and Jeanne-Claude’s “surrounded islands.” This is yet another great example of how intervention in the bay doesn’t always have to be disruptive. As you could imagine, this short 2 week installation saw it’s fair share of environmental uproar. However, it turns out that the manatees in the bay were attracted to the pink fabric. Not only did it provide necessary shade, but the pink sunlight emitted through the fabric stimulated the manatee’s sexual behavior. The fabric also kept boats at distance from the islands which led to more bird migration, for a short while. Our ideas build on these concepts and use amphibious development to create an archipelago of new dense urban centers built well above the bay and existing city. We’re in the process of learning more about the complex ecosystem of mangroves and the way in which they root into the bay for the foundation design of this new city. Our hope is to foster mangrove restoration as well as the habitats that have been lost in their decline. We call this the super block concept and this diagram, on the left, shows a typical suburban block and it’s ration of open green space to building. Clearly, there is quite a bit of green space but the infrastructure to support it becomes very horizontal and thus, inefficient. The city, on the other hand, contains efficient infrastructure, but a lack of available green space. Therefore, our marine city proposal contains “super blocks” that would essentially wrap the suburban block around a central open space and stack on top of each other for vertical efficiency. This contains the benefits of both the sub urban block and the city. This is an example of a tower designed by a very talented intern in our office, Jacob Crociati, and contains the principles established in our marine City concepts. Here, like the Ocean residence, each plate can evolve over time, or restore itself back to nature, depending on the needs of it’s inhabitants. This is a view from one of the outdoor social spaces which could be used for vertical farming, vertical botanical gardens or recreational open space. While our current proposal focuses on Biscayne Bay, it’s certainly not limited by formal constraints such as today’s conventional city. It could be built over water, over land and even over the everglades. The key to this is to understand the fragility of each condition and develop a new archetype which restores and recharges nature below it, all awhile providing for a dense city structure above. Finally, I wanted to quickly end with a few slides of other architects which we feel are implementing these same concepts throughout the world. This is an image of Sumitomo’s forestry tower in Tokyo designed in combination with Nekken Sekkei. Combining nature with CLT construction, it’s set to become the world’s tallest wooden sky scrapper. This evaluates the city not as a concrete jungle, but a wooden forest. Herzog and DeMeuron’s “horizontal Skyscrapper” in Moscow elevates the building far above the ground plane, allowing the space below it to return to nature and preserving the historic character of the former city. The “Farmhouse Concept” by Chris Precht uses a combination of CLT modules and vertical farming to turn a high-rise building into a complex network of residential units and vertical farms. In summary, we believe that we need to change our course from our desperate dedication to fossil fuels and carbon emissions. Our infrastructure needs to be not only renewable, but purposeful and communicative. Our homes and cities need to liberate themselves from the constraints of land and create a new architectural terra firma from which below can restore the natural environment. Can incorporating the experience of landscape in architecture make you happier, healthier, and even wealthier? How can Metabolist ideas potentially solve Miami's sea- level rise vulnerability ? What do a Post- War Japan and Pre-Crisis Miami have in common?